Imagine, you are hiking through the undergrowth of some far distant jungle. As you concentrate on not tripping over or sinking into the mud, you nonchalantly brush aside an oversized leaf in your way and, after regaining your balance as you nearly fall over a cliff, you see there before you a valley that takes your breath away... and it's beauty is not the only thing causing you to gasp... for there rising above the trees is the long, unmistakable neck of a sauropod. Fantasy? Or could members of the superorder Dinosauria have survived into the modern day to share this world with their successors the mammals and the birds? According to our current understanding of natural history the dinosaurs, along with many other orders of animals such as the pterosaurs, died out about 65 million years ago. But some claim that not only did they not die out but that they continued to live through to, at the very least, the "recent" past or even to this day. And a few even claim to have encountered creatures they have identified as dinosaurs. Dragons are often proposed as incorrectly identified dinosaurs. Could our ancestors stories of giant reptilian monsters be based upon early humans encounters with the last remnants of a surviving population of dinosaurs? It wasn't an asteroid! 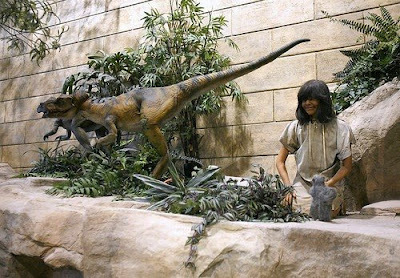 Did St. George hunt the dinosaurs into extinction? The idea is beguiling, but there is far more evidence of a different understanding of the origins of dragons. For instance the heraldic dragon (i.e. 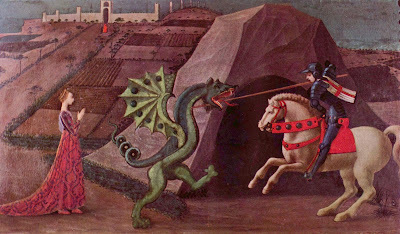 the stereotypical dragon which could easily pass for a badly drawn dinosaur) is NOT what a dragon of British folklore was originally meant to look like. In fact almost all dragon myths were based on giant worm like creatures such as the Lambton worm. It was only later that British dragons were reimagined as having legs and appearing as we now know them. This image was aided by the use of dragon imaginary to symbolise the superiority of Christianity over pagans (dragons) by the Christian authorities in the early years of the Christian church on our islands. But the British Isles were not alone in believing in dragons, dragon myths appear from around the world. Hmm... surely if dinosaurs were so widespread within such recent times would there not be more evidence of their existence? But there are no modern bones, footprints nor any evidence whatsoever of these ancient encounters with dinosaurs. Perhaps, just perhaps, people finding fossils of dinosaurs may have been so impressed that they invented the dragons to explain these finds. But more likely the dragon was the UFO of it's day. It is known many societies considered the sighting of anything unusual (such as lights in the sky) to be indicative of the presence of dragons. Kent Hovind, a former evangelist creationist and current inmate of Federal Correctional Institution Edgefield in South Carolina, is a keen proponent of dragons. He suggests they were simply killed off by humans along with all the other megafauna whereever we settled. Hmm... but we have evidence of the other megafauna, why is there no physical evidence of dragons during that same time period? Of course that's not a problem for him, he thinks the whole world is only 6000 years old. He claims that prehistoric paintings and ancient pottery designs are evidence of dinosaur contact. This is a sort of backhanded insult towards our ancestors. Do people really not believe that they had imagination, and creativity equal to our own? Why is it we believe ourselves to be able to comprehend abstract concepts but everything our ancestors did is interpreted literally? Our ancestors were just as intelligent as we are today. That's why we are here. Plus he keeps calling pterosaurs and plesiosaurs "dinosaurs". That annoys me. It's fine to call them dinosaurs for shorthand purposes in casual conversation. But if you are going to have a lecture about dinosaurs and related prehistoric orders it'd be nice to refer to them by their "kinds" as he insists on doing for everything else, using that stupid childish term. Check out one of his lectures on dinosaurs below, for entertainment purposes only! So have there been any sightings of actual dinosaurs? Well of course there's mokele-mbembe. Reports come from western Africa of a large long necked creature whose tracks are round. What could it be? Some believe it to be a dinosaur. Whilst locals have been talking about mokele-mbembe for a long time the first European to reference it was probably a French missionary working along the Congo river named Abbé Lievain Bonaventure. He reported that he encountered footprints which he says was created by something that ""must have been monstrous: the marks of the claws were noted on the ground, and these formed a print about three feet in circumference." Other than sightings that were heard about or tracks that were seen by European adventurers the first time someone claimed first hand to have seen the mysterious creature was in 1932. Zoologist Ivan T. Sanderson claimed he observed a creature with a long neck lurch into a river and said it was dark coloured with a head the size of a hippo! That would be a very large animal indeed. Locals claim several things about the mokele mbembe. They say it eats the flowering liana, that where it lives it clears the area of hippos and crocodiles, and that eating it is a bad idea indeed (thanks to a story of a tribe who killed and ate one and subsequently all died of poisoning). Many expeditions have been to search for the animal but most have failed either due to not seeing it at all or suffering the usual camera malfunctions. My problem with identifying mokele-mbembe as a dinosaur is that it stretches credibility too far with little evidence. Could it not just as easily be a member of the Hyracodontidae or some other extinct line? 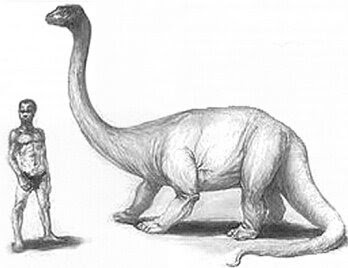 Why do people automatically assume it must be a sauropod dinosaur simply because it has a long neck and tail? Laziness? Giraffes have long necks, and they are mammals. Just because it looks like a sauropod does not a dinosaur make, has no one ever heard of convergent evolution? *Probably not, creationists who are big fans of mokele-mbembe don't believe in evolution after all* Hmm... that of course presumes that the mokele-mbembe exists at all and is not either a made up creature or a misidentified known one. There are many other African "dinosaurs" such as the chipekwe, the emela-ntouka (elephant killer), Mbielu-Mbielu-Mbielu (the animal with planks growing out of it's back or shorthand for creationists "stegosaurus"), the nguma-monene and the mahamba (supposedly a 50 foot long crocodilian so not really a dinosaur. If anything I've got my fingers crossed for a phobosuchus). In 1907, British Army officer Major Percy Fawcett was commissioned to settle a dispute between Bolivia, Peru, and Brazil concerning borders. While venturing deep into Amazon jungle he encountered an animal which he called a diplodocus. Major Fawcett was regard as a honest, “meticulous recorder of facts. Speaking of which... there's a brilliant news story today on the evolution of dinosaurs into birds. The theory that evolution seems to have started even earlier than previously thought seems to be proven in the form of Epidexipteryx. Because bird is just another word for "flying dinosaur". They really do still walk the Earth... and sometimes grace our skies too. Much of the discussion of dinosaurs in the modern world is generated by creationists who form a significant part of the cryptozoological community. Their hope is that the existence of dinosaurs today would help support their belief in a young Earth. How it would is beyond me... the idea of dinosaurs existing today would not damage the theory of evolution. So for now I shake my head in bemusement at their lack of knowledge of what is and isn't a dinosaur (mosasaur... not a dinosaur) and head off to dream of one day encountering a herd of parasaurolophus. Now that'd be something to behold! Great post. I've been laughing at these creationist types for the same reasons you mentioned. They never seem to get their facts right. I actually e-mailed one once and asked him if he knew anything of the feathered dinosaur finds from the last couple decades. He knew nothing about them. May I present my own opinion on this topic? First of let me explain a few of my own findings concerning Mokele-mbembe and other cryptids of Equatorial Africa. There have been at least a dozen Western eye-witnesses who have observed these animals since the 1950. That is, witnesses that we know of. Given the remoteness of the areas in Equatorial Africa where the animals are reputed to live, including the natural hostility of the area, such a venomous reptiles, disease carrying insects and othe hazards, it is very difficult to remain in such a location for very long. The native eye-witnesses that have observed Mokele-mbembes and other strange or unverified animals possess no televisions, radios, books, magazines and are otherwise illiterate. They spend their lives within their communal villages, venturing out into the rivers and forests to hunt, fish, and gather various herbs and edible plants. It is during these extended periods of time (usually several weeks), that they observe animals that they later describe to us upon enquiry. other eye-witnesses include, military personel, river boat officers and government officials who are posted to the more remote villages on the river system. the forest dwelling peoples (pygmies) who describe Mokele-mbembes to us are subjected to a picture test, which includes images of North American animals such as the bear, the moose and the beaver. All of these animals are unkown to our informants and always draw a blank. We then show them images of well known African animals, such as the gorilla, chimpanzee, elephant, hippos, crocodile, and the giraffe. The Baka people recognised all of them with the exception of the giraffe, which occurs only in the northern tip of Cameroon on the border with Nigeria, an area where the Baka do not frequent. We then showed them pictures of some extinct animals, such as the T-rex, stegosaurus, various pteranodons and the triceratops. Almost all of these drew a blank, except the triceratops which bore a VAGUE resemblance to a horned animal that lives in the savannah area between Cameroon and the Central African Republic, and was reputed to attack and disembowel elephants. The native eye-witnesses that have observed Mokele-mbembes and other strange or unverified animals possess no televisions, radios, books, magazines and are otherwise illiterate. They spend their lives within their communal villages, venturing out into the rivers and forests to hunt, fish, and gather various herbs and edible plants. It is during these extended periods of time (sometimes up to several weeks), that they observe animals that they later describe to us upon enquiry. other eye-witnesses include, military personel, river boat officers and government officials who are posted to the more remote villages on the river system. We have made a point of venturing into more remote areas on the river where we have sought out first-hand eye-wintesses, especially those who have never been questioned by outsiders before on La'Kila-bembe and other animals that are currently unverified by zoology. They are not paid or rewarded for their information, and are often puzzled by our desire to locate and observe these animals. Mokele-mbembes/La'Kila-bembes are a problem they could do without - they do not like these animals and avoid them at all costs. To answer those skeptics who claim that Mokele-mbembe is a mythical animal, it is obvious that they have never set foot in Africa. If this animal was a mythical reconstruction, it would be confined to one particular cultural group. Similar animals have been reported by a dozen different ethnic and cultural groups throughout the Congo Basin countries. They all have different names for them, but the descriptions remain almost exactly the same. These details will be covered in detail in my new book, due for a December release. Here is what we know about the mysterious La’Kila-bembe so far: the mature specimens possess armoured skin, not unlike a crocodile, its size ranges from between a hippo and an elephant, its diet is entirely vegetable, it possesses a small head, rather very similar to a python (the nostrils are placed on the front of the snout), its neck is very long and thin, as is the tail. It can also hide underwater like a hippo, but it is extremely hostile towards elephants, hippos and unwary canoes approaching them. The caves we discovered in the Dja were supposedly used by the animals to repose during the dry season. The females also construct large nests in the swamps where they rear their young. Those eye witnesses who have observed the animals mating state that the male of the species possess dermal frills but have a shorter neck than the females, who do not possess dermal frills. This is clear reference to sexual dimorphism within a species. Regarding the live birth theory, this is all that it is at present - mere speculation. However, live births among certain lizards, skinks and constricting snakes is well documented. The information on live mokele-births has come from a few Baka hunters who have seen female La'Kila-bembes with one young calf, but only very rarely. The 20 year reproduction gap for the La'Kila-bembe is of course a mere theory at this point, but not completely unknown in the world of reptiles. The Tuatara of New Zealand belongs to the ancient order of Sphenodontia and reproduce very slowly, taking ten years to reach sexual maturity. La'Kila-mbembes may be in the same boat (if it too belongs to a relic species), but the absence or rarity of offspring maybe due to them falling prey to large crcodiles, or is perhaps an indication that the animals, whatever they are, are nearing exctinction. If we are to PRESUME that La’Kila-bembe is a surviving sauropod, then the closest match we can find in Africa is to an early proto-sauropod called the Vulcanodon. The fossil bones of this particular sauropod have been discovered in southern Africa. nevertheless, until we have actual proof of the animal’s existance the verdict is open. I have discussed the possible identity of the animal at length with Roy Mackal, and we have reasched at least one conclusion. All we can say with certainty is, that the Mokele-mbembe/La’Kila-bembe’s are undoubtedly living but very rare semi-aquatic animals, the description of which do not correspond with any known living animal within the current repertoire of contemporary zoology. Each expedition brings us closer to our prey. Hopefully, we will have something more concrete for you in November 2009. Regarding the Ngoubou/Emela-ntouka, it would not suprise me if this animal was a rhino of some kind - perhaps even a new species. The game wardens in South Africa’s Kruger National Park have witnessed some epic battles between rhinos and elephants when the two encounter one another at water holes. The elephants however, always win. Perhaps the Ngoubous are faring better against the smaller less aggressive forest elephants in Congo and Cameroon. The savannah dwelling Ngoubous are described as being heavily armored, with a beaked mouth, up to six horns (or spikes) protruding from is head/neck area, and a thin tail like an elephant. The animal is also said to give birth to a single calf. All these factors tell me that the savannah Ngoubou is most likely a mammal of some kind, and possibly nothing more than a large armored rhino. An unusual rhino perhaps, but a rhino just the same. It would nevertheless make a fascinating discovery, considering that they are shot for food from time to time. The river N'Goubous are described as possessing from one to two horns (again, sexual dimorphism? )and can hide under water like a hippo. A two horned specimen was trapped and killed in a Baka elephant trap as it exited the Boumba River in 1996. We are now setting up a reward system for the Baka for any physical evidence they can keep for us, such as a horn, piece of bone, skin or a tooth. Indeed, anything that can yield DNA evidence. The oft-mention “Kasai rex”, an alleged bipedal carnivorous dinosaur living in Central Africa that is circling some crytpozoology and creationist websites is a complete hoax. Every single ethinc and cultural group that I have interviewed throughout Congo and Cameroon have never heard of the animal, and images of bipedal dinosaurs whether carnivorous or herbivorous have always drawn a complete blank. Case closed. Finally, I should mention that any discovery of a living dinosaur will not, in my opinion, prove the Bible to be a handbook on living dinosaurs, prove that the earth is 6,000 years old, or disprove evolution. The discovery of a living dinosaur will be absolutely monumentous, and I hope a huge leap forward for science in studying and learning more about these fascinating animals. I hope that my forthcoming new book on Mokele-mbembe will help to clarify this subject somewhat for all interest parties, regardless of where they stand on the question of origins.